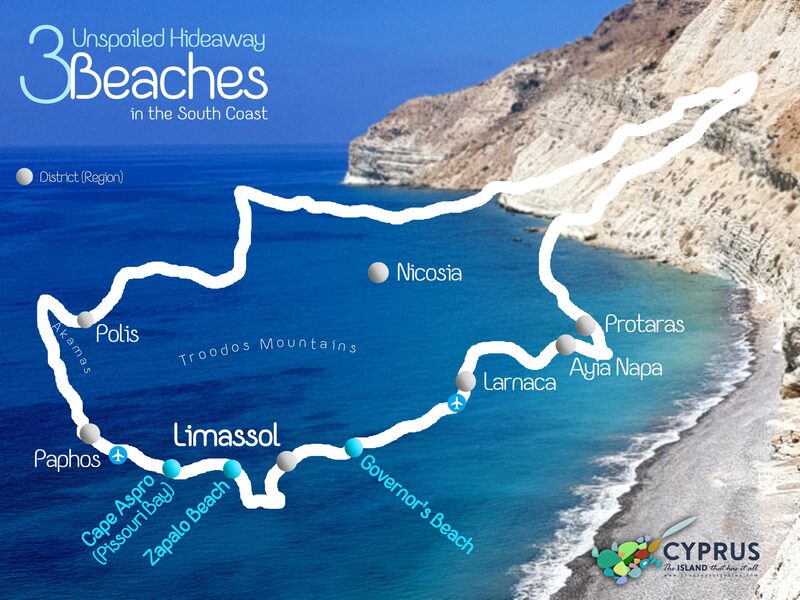 The south coast is Cyprus at its most diverse. Beaches hem the shore and offer relaxed holiday fun. A sunlover’s haven, Limassol is blessed with 16 kilometers of beachfront. This long stretch of sandy beaches includes areas with excellent facilities and clear waters that have been awarded with the Blue Flag label. Hotel developments may have taken over much of the coast, but drive a little further afield and the natural beauty of the region reveals itself. Beaches around Episkopi Bay nestle in against verdant farmland and dramatic bluffs, while inland the countryside rolls upward in hilly waves, with roads edged by olive and almond trees and vineyard rows. Here's a look at the three most unspoiled hideaway beaches in the South Coast. Located right under the Sanctuary of Apollo Hylates, Zapalo Bay is propably the most spectacular beach in the Limassol District. It is a large bay which combines steep cliffs, fine brown sand, white rocks and crystal-clear deep-blue waters. The view from the top of the bay is stunning. The first thing that strikes the eye are submerged rocks , remnants of an old port, and the two small piers currently used by local fishermen. It takes some time to figure out how the fishermen maneuver in between the reefs. The west side of the bay has beautiful fine brown sand, shallow waters, making it ideal for relaxation. The large cape protects this part of the bay from south westerly winds, resulting in completely calm seas, where the only sound you can hear is the singing of birds flying in and out of their nests in the steep cliffs behind you. The feeling is magical. Moving towards the east part of the bay, you can find some old dinghies, lying on the shore or underwater, before reaching a wooden bench under a tent, one of the few spots for shade on the beach. The far eastern side of the bay is more rocky and the sea tends to be rough. Large flat rocks make great "orthopaedic" sunbeds to lie on but do make sure you take a hat, sunglasses and plenty of water with you. A landscape of unique, wild charms unravels at the western coast of the Limassol district. Cape Aspro, whose name is related to the white, chalky cliffs rising above the beach, is undoubtedly one of the most spectacular places in the Limassol district. Governor’s Beach offers the perfect balance of a beautiful natural setting and mild human intervention. Dark grey sand with graceful white chalk rocks protruding into the navy blue sea are complemented with sunbeds,umbrellas and nearby amenities, making your visit here both relaxing and comfortable. The coastline is divided into several organised beaches and small sandy coves, seperated by the natural sedimentary white rocks. The eastern section of the beach welcomes you with a lovely green setting and a children’s playground leading to one of the most scenic cafes in Cyprus overlooking the Mediterranean sea.The beach itself is located below the chalk cliffs and can be easily accessed using one of the several ramps or steps which can be found near the cafe. Heading west, you will find another organised beach in a truly magical setting, under beautiful eucalyptus trees. The Blue Flag beach has a nice sandy shore and in combination with the usually calm sea is ideal for kids to enjoy. Nevertheless, care should be taken around the protruding rocks and specifically diving into the shallow waters should be avoided. Couples will particularly enjoy the intimate sandy coves, peaceful atmosphere and romantic walks along the sea shore. Facilities such as showers (at a small fee), toilets and changing rooms can be found at the restaurants above the beach. A camping site is also located just above the beach. It is worth spending a full day at Governor’s beach, where apart from the sea, visitors can enjoy a good meal at one of the several restaurants, offering Cypriot cuisine and delicious fresh fish dishes. Governor’s Beach is well sign-posted on the highway and lies about 10km East from the main hotel area in Limassol. After taking the exit from the highway, follow the signs until you reach a T-junction with signs for “Kalymnos” in the left direction. After about 300m you can find the camping site and thereafter the parking lot for the beach. For people with disabilities, it is best to continue driving past the parking lot and follow the dirt road wich leads straight to the sea-shore. Looking for Hotels in Limassol? Explore our wide range of hotels in Limasol City and the District and find the perfect hotel for your stay. Book your Limasol hotel now !